Develop a comprehensive retirement income plan to determine how long your money will last. Provide strategies to potentially make cash flow last longer. Develop a suitable asset allocation for retirement to reduce stock market risk and provide income. Evaluate all life insurance, disability income, and long term care policies for suitability. Recommend changes to save money or improve coverage. Evaluate beneficiary designations as well as all estate documents including wills, powers of attorney, health care directives, and trusts for suitability. Evaluate all filing strategies and determine the most suitable to optimize benefits. Maximize benefits for surviving spouse. Review health insurance options to keep costs down. 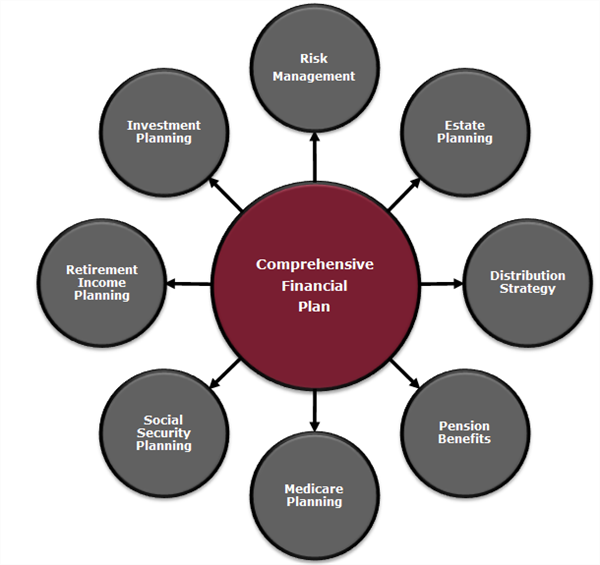 Coordinate with Social Security and employer plan. Evaluate distribution alternatives from company plan. Recommend optimal pension pay out. Evaluate the benefits of consolidating company retirement plans utilizing rollover IRAs. Determine if having a Roth IRA would be advantageous. Review employer stock plans and vesting schedules. Review deferred compensation plan and recommend distribution options. Review annuities for suitability and recommend how to improve benefits. Conduct life insurance audit. Pinpoint ways to save money with lower cost policies. Review investment accounts; consolidate where appropriate. Review account types: taxable, tax advantaged (tax-deferred/tax-free). Develop a suitable distribution strategy to minimize taxes. Review non-qualified accounts for tax losses; propose a plan to reduce taxes. Objectivity is the key to our process. We offer a multitude of investment and insurance products from some of the largest insurance and investment management companies in the country. We can shop so you can save! Would you like a second opinion on what you are paying for your financial products? Maybe we can save you money or increase your benefits. If so, please call us today at 773-380-8533.